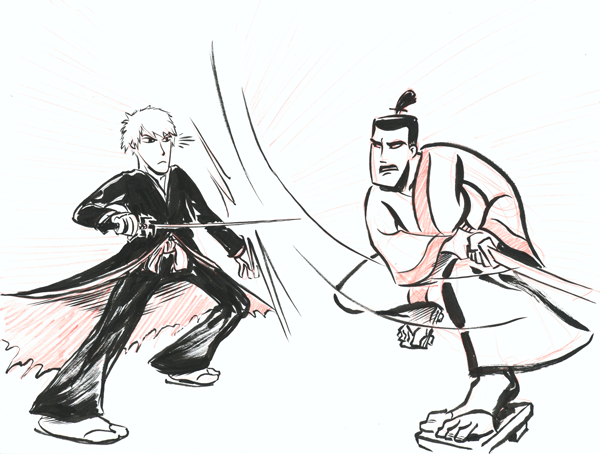 Another commission, this time for Chris Riley, who asked for Ichigo Kurosaki (in his Bankai fighting mode) vs. Samurai Jack. I’ve never seen Bleach, so I don’t know who would win here. Any of you guys have an opinion about this? Want a sketch from me? You can always get one through the Multiplex Store — or, for the next few days, pledge for the Draw Something Pack in the Book 2 Kickstarter Project.